When the Red Sox reached New York on Wednesday night, they did so riding the momentum of the David Ortiz home run that earlier that same evening had delivered a win over the Rangers, and given Boston the better of its series with Texas. But as the Sox left the Bronx late Sunday night, the pendulum certainly seemed to be swinging in the other direction. A weekend during which questions arose about the health of Koji Uehara’s right shoulder, as well as Dustin Pedroia’s left wrist, ultimately ended with the reigning champs losing three of four to their primary rival, the Yankees claiming a 3-2 victory in the last installment of a four-game series that leaves the Sox looking up from the bottom of the American League East. Stumbling to 5-8 on the season, only Kansas City has a worse winning percentage than Boston among AL clubs. Meanwhile, no team in baseball has been worse over its last 10 games than the Sox have been (at 3-7). And only once since winning two of three in the season-opening series at Baltimore have the Sox won a game without relying on a game-deciding three-run homer. That came from Ortiz on Wednesday. Then another came from Grady Sizemore on Friday. But it never came Sunday. And with Ivan Nova limiting the Sox to just a couple of instances where they could hit with a runner in scoring position, its absence was again dooming. Some shoddy Yankee baserunning kept the Yankees from scoring in the first, when they put runners on second and third with one out, but wasted the opportunity when Jacoby Ellsbury was gunned down by Jackie Bradley Jr. while trying to advance from second to third on a flyball to center. Because Ellsbury was tagged out before Carlos Beltran could cross the plate, his run didn’t count. That enabled the Sox to take the game’s initial advantage in the second, as Jonathan Herrera plated Ryan Roberts with a single to center. But later in the rally Bradley was thrown out when trying to score on Grady Sizemore’s knock to left, so Boston was forced to settle for one run despite four hits in the frame. And that allowed the Yankees to take their first lead an inning later. With one out, Brett Gardner pulled a sharp single to right, and Doubront subsequently left an 84 mph changeup over the heart of the plate to Carlos Beltran – who ripped it into the first row of seats beyond the left-field fence for his second homer in two days, and a 2-1 Yankee lead. Overall, Doubront (6.2 innings, 3 R, 7 H, 3 BB, 2 K) was much better than he was five days earlier, when he was yanked after 2.2 innings in the shortest start of his career. But still the Yanks extended their edge to 3-1 in the fourth, when umpires used video replay to reverse what would’ve been an inning-ending double play ball off the bat of Francisco Cervelli. That allowed Brian McCann to score what eventually became the game-winning run, and in the end the officials were probably right to overturn the call, but John Farrell wasn’t interested in accepting that decision after getting slighted by baseball’s new replay system on Saturday afternoon. 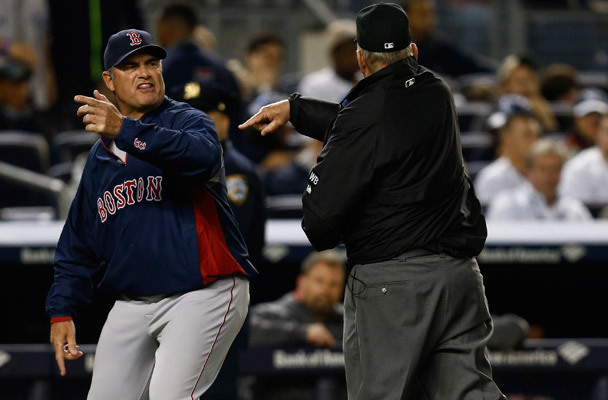 After a passionate protest, the Sox manager was ejected. That turned out to be a particularly big ruling because Mike Napoli led off the sixth by mashing Ivan Nova’s four-seamer some 439 feet, and deep into the left-field seats. That closed Boston to within 3-2, though Nova responded by retiring the final seven hitters he faced, and then the Sox couldn’t capitalize on a quality chance in the eighth. After Ichiro Suzuki robbed David Ortiz of a double with a leaping catch near the wall in right-center, Napoli doubled, Daniel Nava walked, and A.J. Pierzynski took a David Phelps fastball off his elbow pad. That loaded the bases, so acting manager Torey Lovullo sent Mike Carp to bat in place of Roberts. The battle began by Carp taking two balls, but Phelps followed with a pair of called strikes – then, after Carp spoiled three more pitches by fouling them off, he whiffed only a low curveball to end the eight-pitch encounter. And enable the Yankees to escape. De facto Yankee closer Shawn Kelley then retired the Sox in order in the ninth. And sent Boston reeling toward Chicago.